My print ‘The Survivors’ was one of the artworks chosen by the Guelph Museum’s exhibition of artworks related to Lieutenant Colonel John McCrae, soldier/physician/poet and his poem ‘In Flanders Fields.’ They subsequently choose it for the cover of the Exhibition Catalogue. Now the Ontario Legislature has asked to include it as one of the artworks in their Remembrance Day resources. …..my buzz du jour. “To me the poem conjures up visions of more than poppies and crosses. I envision the other casualties of war, of the long lines of refugees and of wounded soldiers returning to their homes. I see the shells of buildings and a landscape badly scarred. Busy cleaning up my studio ’cause it’s almost here….The 2015 Studio Tour. 42 Artists and Artisans in their studios and exhibition places. 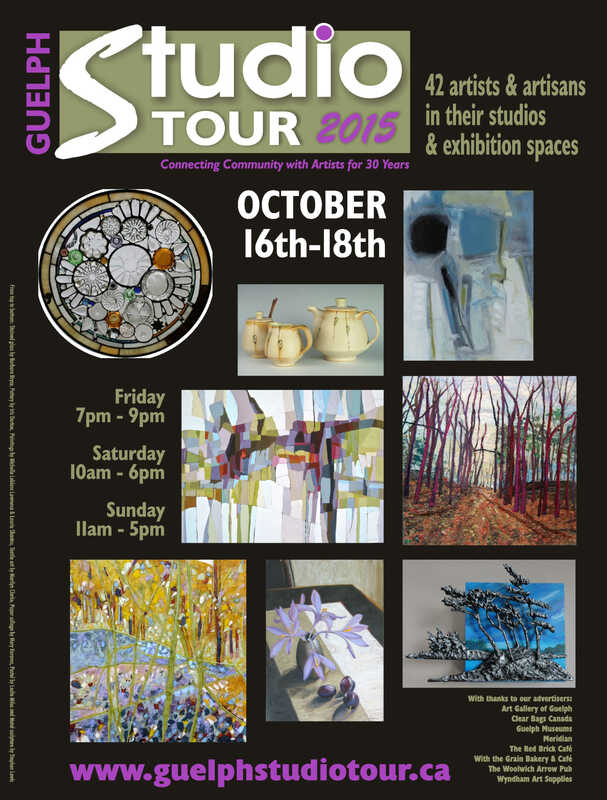 Visit www.guelphstudiotour.ca for more info!